Did you know that the Russian word for "violin" means "scratch"? 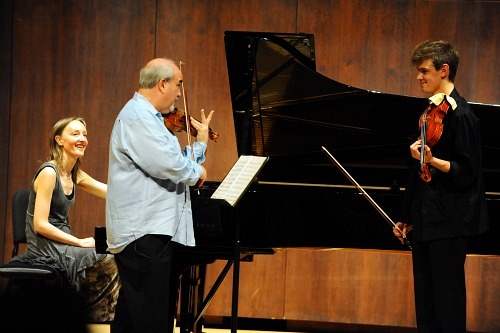 That was just one of the many ideas that came out of a masterclass last Wednesday by New York Philharmonic concertmaster Glenn Dicterow, a graduate of The Juilliard School and former concertmaster of the LA Philharmonic. 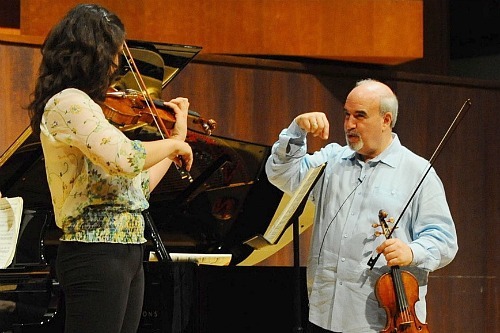 He advised students about bow articulations, artistic decisions and "being the soloist" at a master class last Wednesday at the Starling-DeLay Symposium on Violin Studies at Juilliard. Blake Pouliot, 17, of Toronto, took the stage first, with the second-movement Scherzo from Dmitri Shostakovich's Violin Concerto. He played with strength, full bow control and a great posture. It was a polished performance -- he knew this piece well. He also seemed to enjoy the wild and raucous ride of the Scherzo movement, ending with a wide smile on his face. New York Philharmonic concertmaster Glenn Dicterow, left, and Blake Pouliot of Toronto. On the left is pianist Pamela Viktoria Pyle. Photo by Nan Melville for The Juilliard School. After praising the performance, Dicterow first made recommendations about how to approach the numerous bow attacks in this music. He felt that Blake "placing" the bow a bit. "'Placing' is not a good word for this piece -- what will really help for this piece is the attack," Dicterow said. ""Attack and get away. You need a Maserati attack: you need to grab the road with the tires." Dicterow said he once heard Igor Oistrakh, son of the great David Oistrakh, for whom the concerto was written, play this piece, and he attacked the string from a great height above the violin. "It might scratch, but…take a chance!" Dicterow said. "Use the palm weight rather than just the wrist weight." Blake played it again with more altitude in his attacks, which did make for stronger attacks. Afterward Dicterow took a moment to commend the pianist, Pamela Viktoria Pyle, for nailing the considerably tricky piano part. Dicterow also sought to give Blake a more solid plan for hitting the many harmonics that require a fast zip up the fingerboard. "I think today is the day you go to Vegas because you hit so many of those flying harmonics without spending much time there," Dicterow said. "Spend more time there," about 50 percent getting there and 50 percent staying on the harmonic note. Dicterow observed that this piece was written as a sneering political commentary. "It's meant to be annoying, and you're doing a good job!" Dicterow told Blake. Of course, he could always make it a little more annoying. Dicterow wanted a little more swoop at (grab your score) rehearsal letter 45, also known by me as the place where the party starts. He also wanted it to be "more peasant like, more gypsy, more jewish…get everybody in there! You can play around with rhythm -- it's amazing what you can get away with." The movement continues in this vein, and Dicterow wanted less lyricism and more brutality. "This is a place where you have to beat it up," after all, the Russian word for violin, "skripka," literally means, "scratch." Next was Marié Rossano, first-place laureate of the 2010 Stradivarius International Violin Competition and other awards, who studies with Simon James and Brian Lewis and who will begin studies with Ida Kavafian and the Curtis Institute this fall. She was also a participant in the 2009 Symposium. Marié played the arresting, tonally meandering beginning with breathy bows, sometimes nearly sans vibrato. It's not a piece that plays itself, and Marié shaped it with well-calibrated dynamics and restraint, building a long line to a beautiful culmination, after which the piano, playing the part of an orchestra violin section, ascends even higher. After this extremely high chaos in the orchestra blows its energy, the movement breathes easier and the violin ascends and fades into the stratosphere (a high D). Dicterow praised Marié's interpretation for its "serenity and purity of sound." In a piece woven from such a pure and unbroken thread of sound, one danger is that the sound will dip unintentionally during some of the longer notes. Dicterow advised her to be aware of this happening a few times. "Play this like you don't have a bow, but you're playing this with complete circular breathing." In the quiet beginning, he said, "keep it under wraps for longer; keep it going without interruption, without too many plateaus. Patience," he said. "Don't be shy about taking as many bows as you want to take." The orchestra (piano) part is very similar to the violin part, almost canonical, and here Marié was showing some deference to the melody, when it moved to the piano. However, because the part is so similar, there is a danger: "They are supporting you, but don't let them overtake you," Dicterow said. As the person standing in front of the orchestra with the fiddle, "you're paid for being the soloist." Also, the connected notes of this movement benefit from a continuous vibrato. "You'll get more liquid legato if you don't stop the vibrato for the change of note," Dicterow said. It's important to be aware of the different tone color of each string, as well. Toward the end of the piece, one of the themes returns, and, played in position, just one note winds up being on the "A" string. "The mute goes on the minute you go on the 'A' string," Dicterow said. To keep it all the same shade, keep the whole thing on the "E," even if it makes for a few awkward shifts. Brandon Garbot was next, playing the first movement of the Sibelius Violin Concerto. Since participating as a student artist at Juilliard symposium in 2007, Brandon has won numerous competitions, including the 2011 concerto competition for Cleveland Orchestra Youth Orchestra, where he is concertmaster. Originally from Portland, Ore., he now studies at the Young Artist Program at the Cleveland Institute with William Preucil. After a beautiful performance, Dicterow offered quite a compliment on Brandon's interpretation: "It's very original, it's not like anybody else," Dicterow said. "It is very convincing, most of the time -- Ninety-nine percent of the time." Dicterow then helped him sort out what of his original ideas were working well, what seemed a little disjointed, and what needed further exploration. Dicterow asked for more bow in the beginning, to avoid getting a "compressed" sound. In one passage he said, "That was very dramatic, what you did, then you come in like a little puppy!" It needed to be strong, after the drama. Brandon had a nice gesture in a fast passage, and Dicterow liked it. He asked, "Where did you get that?" "I thought of it myself," Brandon answered, and the audience applauded. "Your playing is so imaginative," Dicterow said, "you're not copying 400 YouTube performances. All you're doing is so original." In another area (score: "poco a poco affrettando il tempo") "You're phrasing with the right dynamics, you're the only one I've heard who does that right," he said. In the end Dicterow encouraged him to keep up the intelligent music-making and keep working on physically bringing it into performance in a cohesive way. "You're a big thinker," Dicterow said, "but sometimes you need to let your gut take over." Marie-Christine Klettner of Salzburg played Schubert's Fantasy in C. Marie-Christine studies with Igor Ozim at the Mozarteum University Salzburg and will play at the Verbier Festival in Switzerland this year. She produced a milky tone from her 1849 Vuillaume, occasionally looking at the audience as she played. "This is a monster piece, for both instruments," Dicterow said, when she was finished. "It's a piano concerto, and it's also a violin concerto." Marie-Christine was starting the piece with one very long bow, and Dicterow suggested simply taking a lot of bows. "Start up-bow, and somehow, without my knowing it, change it to down-bow," Dicterow said. "You just need the physical presence of a lot of molecules moving across the string to keep the sound from getting compressed. If you need bow, you take it, through the whole first part. You need to get that sound out, and Schubert is exposed. It's not like you can hide, anywhere." Marie-Christine Klettner and Glenn Dicterow. Photo by Nan Melville for The Juilliard School. Dicterow wanted Marie-Christine to play a little louder in a place where she was backing off. "She has the melody," explained Marie-Christine, referring to the melody being in the piano, played by Pamela Viktoria Pyle. "You have the violin in your hand, and she has the 500-pound gorilla," Dicterow said, then to Pamela, "of course, she makes it sound like the heart of an angel…" But you still have to be the soloist. He also reminded her of the Viennese nature of Schubert's Fantasy, that "it needs to be charming -- overly charming. Bouncing all the time." Notes on the G string shouldn't sound like the Brahms Concerto, they should be less heavy, more "bouncy, like a trampoline." For Justine Lamb-Budge's Beethoven Sonata No. 5 "Spring", Op. 24, Dicterow talked about Beethoven's mercurial nature. (Justine is a student at Curtis Institute, studying with Ida Kavafian and Joseph Silverstein). The composer was kicked out of some 30 apartments for his loud outbursts, floor thumping and unacceptable personal hygiene habits, after all. His music, even something as sunny as the "Spring" Sonata, has some of his volatile nature. For example, the element of surprise, "that sudden change," he said. "Don't prepare them for the surprise, let it be a surprise." Also, the music needs to have a base level of energy, he said, "wired with coffee rather than falling asleep." I've so often heard (from experienced violinists) that russian violinists tend to cushion attacks while those who stem from Galamian's tradition tend to attack roughlty as a shark. Some say jokes that every Galamian/Delay student scratch. I certainly don't agree on that though! Since Shostakovich is russian, I assume that "cushion attacks" and slavic lyricism are still a great part of that music even though it has to sound powerful and as a striking protest of course! But perhaps that's what Dicterow said too... He surely didn't meant to attack brutally without making it grandiose or musical at the same time. He was talking specifically about the Scherzo movement, and just the attacks. So it's not like he was advocating an overall brutal approach, just throwing a little more weight and grit at those attacks. Shostakovich was living in a horrendouslky brutal area and time when he wrote that piece. I agree, where it's supposed to be brutal then have at it, take no prisoners. Thanks for the precisions! Interesting! And I thought only heavy metal was brutal. Is the indication on the manuscript 'brutale con la forza'.